Trump and his anti-environment cronies are going to try to destroy the planet — here's how to fight back. U.S. and world leaders have failed to undertake the necessary actions to prevent calamitous climate disruption. And over the next four years, our federal government will be under the control of a climate denier and administration filled with fossil fuel industry lobbyists. But this doesn't mean we're doomed. It only means that the fight for climate justice is now, more than ever, about organizing on the local level. Here's some ways you can contribute. The Standing Rock Sioux Tribe's (standingrock.org) courageous refusal to allow a private corporation to build the Dakota Access Pipeline (DAPL) — a portion of which would tunnel under the Missouri River and desecrate historic tribal lands — has galvanized indigenous peoples across North America. Since August, thousands of other protesters have joined in solidarity on the front lines near the Oceti Sakowin Camp to block the bulldozers. They've come up against dangerously militarized police who have attacked them with pepper spray, dogs, and other weapons. But the protest has only grown. The Standing Rock Sioux now find themselves leading national opposition to the ongoing construction of oil and gas pipelines and other fossil fuel projects that endanger the health and safety of the communities they run through, and which drive climate change. But winter is coming, the cold, harsh winter of the Great Plains. To support the Standing Rock Sioux tribe's stand against the DAPL, visit StandWithStandingRock.net and consider making a donation to pay for camping gear, food, and other supplies. Since 1978, Communities for a Better Environment (cbecal.org) has organized against environmental racism in northern and southern California. CBE's track record of success includes stopping the expansion of dirty oil processing at Richmond's Chevron refinery, reducing air pollution from refiners in southern California passing stronger clean air regulations, and forcing oil companies to clean up hundreds of former gas stations polluted with MTBE. CBE runs a leadership academy where they train young organizers to prepare for roles in social movements, and government. The group just opened a new Richmond office where they'll continue working to transition California's economy from toxic industries to a green, just future. 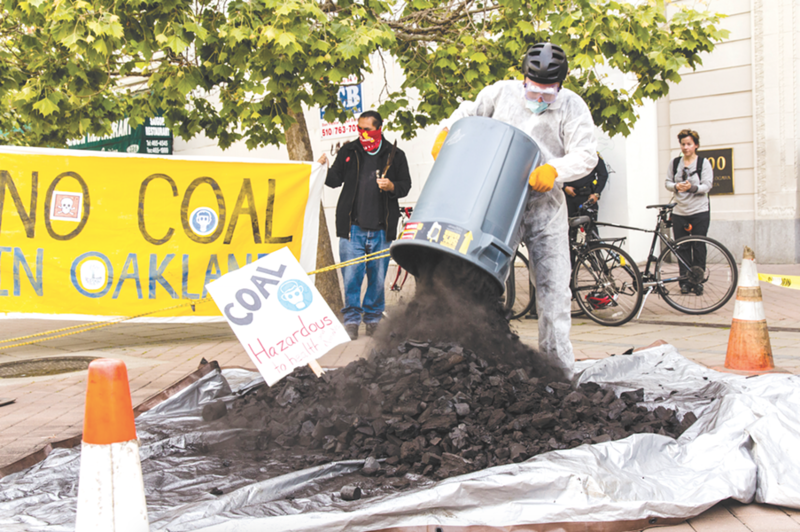 A lot of individuals and organizations helped stop the coal industry from building a massive export terminal in Oakland this past summer. The Sierra Club's San Francisco Bay Chapter (SierraClub.org/San-Francisco-Bay) was one of them. Founded in 1924, and part of the granddaddy of all environmental groups, the SF Bay Chapter focused on conserving pristine land for much of its history. This is part of the reason the East Bay has beautiful bay shore and ridge top parks with miles of trails and stands of giant trees that purify our skies. In the 1980s, the chapter helped lead the region's fight against nuclear weapons. In the 1990s, it increasingly took on campaigns for social and environmental justice, including advocacy for public transit, and opposing landfill expansions near communities of color. In the 2000s, clean energy became the group's top priority, bringing its substantial resources to the fight for climate justice. The Rainforest Action Network (Ran.org) works to achieve two interwoven goals that are crucial to stopping climate catastrophe. They protect rainforests from greedy global agribusiness and timber companies, and they rumble with fossil fuel companies, and the banks that finance them, to prevent more carbon fuels from being mined and burned. Their campaign to pressure big banks to stop financing coal and oil companies has been highly successful. They've also slowed down the federal government's program of leasing federal lands for oil, gas, and coal mining — a critical step due to the fact that much of America's fossil fuel energy is buried under public land. RAN also manages a climate action fund that provides small grants to frontline communities organizing against coal mining, deforestation, land grabs and resource privatization.